If the trend continues, it threatens the viability of more rural primary schools along the Atlantic corridor, while at the same time the school building programme is playing catch-up on the burgeoning populations elsewhere. The urban-rural gap raises wider questions about the effectiveness of Government policies for regional and rural development. But the department's latest bulletin illustrates the uneven nature of year-on-year change, particularly at primary level, with falling enrolments in six counties or administrative areas, predominantly on the western seaboard, while Leitrim was static. 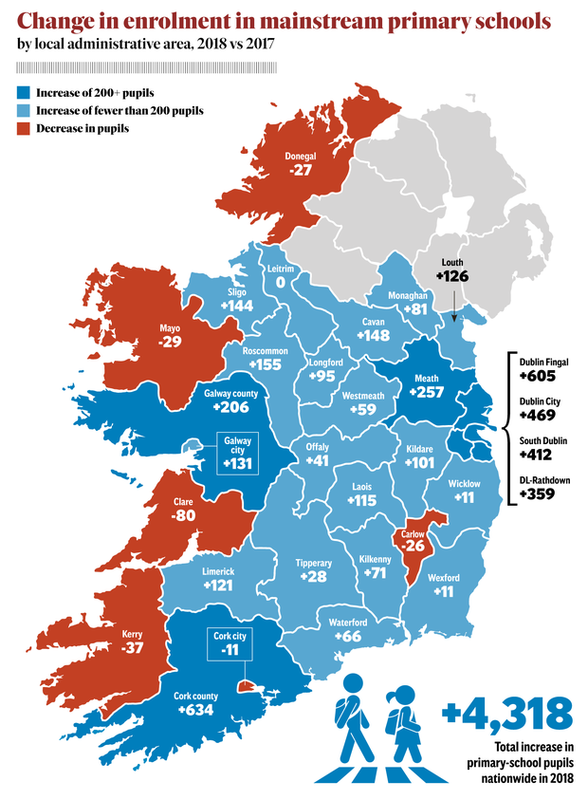 The biggest decline was in Co Clare, down 80 pupils - from 13,682 to 13,602 - followed by Kerry (-37), Mayo (-29), Donegal (-27). There was also a dip in Carlow (-26) and Cork city (-11). In contrast, enrolments rose in 24 areas, including in all of the four Dublin local authority zones, and particularly in Fingal and Dún Laoghaire-Rathdown, each of which had increases of 1.5pc-2pc. In Fingal, more than four in 10 (41pc) primary schools saw an increase in pupils, while enrolments grew in 37pc of schools in Dublin city. Fingal also has the largest primary schools, at an average 415 pupils. Meanwhile, Roscommon, Sligo and Galway city bucked the downward slide west of the Shannon, with an overall rise in pupil numbers running at twice the national figure. Although Roscommon's 2pc rise was the largest percentage increase, the county has the smallest schools, at an average 86 pupils each. Cork county, Cavan and Laois also experienced above-average rises in primary enrolments, followed by Galway county, Louth, Meath, Monaghan and Kilkenny. The picture is somewhat different in the second-level sector, which is now feeling the effects of the baby boom in the first decade of the 21st century. Post-primary pupil numbers are up everywhere this year except Dublin city and Dún Laoghaire-Rathdown, with Fingal and Louth both showing the biggest increases, which at 3.3pc each are more than double the average. Cork county is also ahead of the average, with a 1.8pc pupil rise. Other counties with a significant increase in post-primary enrolments were Meath, Kildare, South Dublin, Galway county, Kilkenny and Limerick. While Dublin city schools suffered an overall drop of 15 pupils, in Dún Laoghaire-Rathdown, which covers a swathe of south Dublin, the decline was a more remarkable 104, well against the national trend. There is no obvious reason for this, but it may be linked, in part at least, to a reported flow of students to so-called "grind schools", which are not included in Department of Education statistics.